With the large scale reduction of the crude steel production through the ingot casting route, there is now-a-days a tendency of producing extremely heavy weight steel ingots weighing over 600 t and continuous cast strands with thickness over 450 mm and rounds with diameter over 800 mm. These large size crude steel products are mainly applied for retaining components like reaction vessels for nuclear power plant and rotating components such as drive shafts of gas turbines and generator rotors. These high value products require high quality of the as-cast crude steel products, and hence, the production of the heavy crude steel products with adequate control of the quality is a big concern for steelmakers worldwide. The macro-scale segregation of alloying elements during the casting of steel ingots continues to afflict the manufacturers of steel ingots, despite many decades of research into its prediction and elimination. Defects such as A-segregates are still common, and components are regularly scrapped due to their presence, leading to increased economic and environmental costs. With the growth of the nuclear power industry, and the increased demands placed on new pressure vessels, it is now more important than ever that today’s steel ingots are as chemically homogeneous as feasible. During the solidification of alloys (liquid steel), solute is partitioned between the solid and liquid to either enrich or deplete the inter-dendritic regions. This obviously leads to variations in the composition on the scale of micro-metres (micro-segregation). Macro-segregation is a composition inhomogeneity in the scale from several millimeters to centimeters or even meters. The effects of macro-segregation are critically important in the present day applications of steel ingots and hence the ability to predict segregation severity and location is very important and highly sought after these days. Almost all types of macro-segregations in steel ingots are undesirable since the chemical composition variations have a detrimental impact on the microstructural and mechanical properties of the steel. Further, it is also not possible to eliminate macro-segregation by thermo-mechanical post-treatments because of the large distances involved and the low diffusivity of the solutes in the solid state. Hence, macro-segregation is one of the well-known occurring casting defects and results into a tough challenge of scientific and technological importance in the field of solidification and casting of the steel ingots. During the last few years, customer requirement of the large as-cast products have been concentrated mainly macroscopic cleanliness requiring low levels of macro-segregation. Although several experimental studies on heavy ingot casting have started many decades ago, fundamental knowledge and deep understanding of some of the basic macroscopic casting phenomena for the control of solidification of liquid steel in ingots are still missing in the area of A-segregation, sedimentation of free crystals, convective fluid flow during solidification, and the macro-segregation. Though, the understanding of the processes leading to segregation has since improved considerably, still however, the macro-segregation can still be observed in ingots made today. 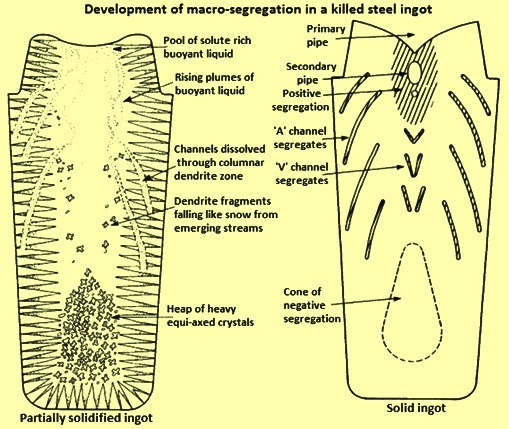 The phenomenon of the formation of macro-segregation during the solidification process in ingot mould is shown in Fig 1. Up to the mid-1960s, solute build-up at the tips of advancing solid interface was believed to be the major underlying cause for the macro-segregation phenomena in the steel ingots. However, this thinking has since been established to be erroneous by numerous theoretical and experimental studies. It is now well recognised that the majority of solute is rejected sideways from a growing dendrite, enriching the mushy zone, and that build up in front of dendrite tips is negligible in this regard. 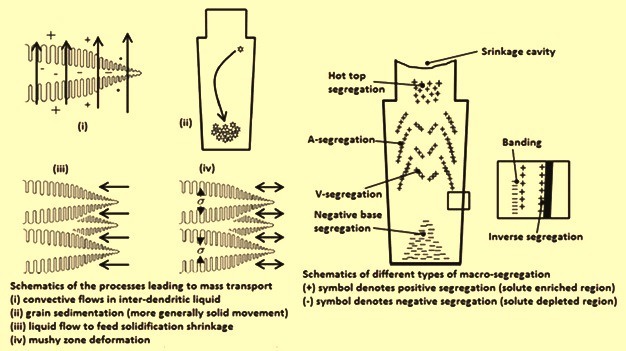 All types of macro-segregation are derived from the same basic mechanism which is the mass transfer during solidification. The movement of enriched liquid and depleted solid can occur through a number of processes as shown in the Fig 1 and described below. Convective flows due to density gradients caused by temperature and composition variations in the liquid. The thermal and solutal buoyancy contributions can either aid or oppose each other depending on whether local temperature and concentration fields cause liquid density to increase or decrease. The convection due to the coupled action of temperature and solute is known as ‘thermo-solutal’ convection. 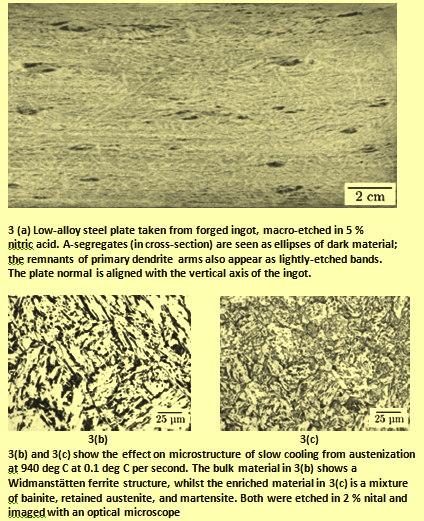 Movement of equiaxed grains or solid fragments which have either nucleated heterogeneously in the liquid steel, become detached from dendrites due to remelting/stress, or have separated from the mould wall after pouring. Equiaxed grains in steels are denser than the surrounding liquid and hence they tend to sink. This mechanism, along with convective fluid flow, is a dominant macro-segregation process in the steel ingots. Flow to account for solidification shrinkage and thermal contraction of the liquid and solid on cooling. Deformation of the solid network due to thermal stresses, shrinkage stresses and metallo-static head (the pressure provided by the liquid steel above). Imposed flows due to pouring, applied magnetic fields, stirring, rotation etc. The tendency of elements to segregate is expressed by the equilibrium distribution coefficient, K0=Cs/Cl where Cs is the concentration of the element in the solid phase and Cl is the concentration of the element in the liquid phase. This is because of the different solubility of elements in liquid and solid steel. Generally found macro-segregation patterns in steel ingots (Fig 2) are (i) a positively segregated zone at the top, (ii) negative segregation near the bottom in the equiaxed zone, (iii) inverse segregation near the ingot surface, (iv) A-segregation in the columnar zone, and (v) V-segregation along the centerline. These in-homogeneities can limit seriously the yield in the ingot casting and at the same time leads to the problems in the further processing and final properties of the steel. During these days, numerical simulation on solidification has been widely applied for the prediction and control of macro-segregation as well as the as-cast structure. However, quantitative prediction remains difficult attributed to the complexity of solidification in multiple scales and the interaction with the microstructure. As the multiple scale solidification models are based on a couple of macroscopic and microscopic mathematic models, the deeper the understanding on the physical phenomena is, the more accurate the prediction can be there. It is generally believed that macro-segregation results from the relative movement of solute enriched liquid or solute deficient solid phase during solidification. Examples are thermal/solutal driven natural convection of the liquid in the mushy zone, flow due to solidification contraction, and the sedimentation of free equi-axed crystals over the scale of the whole cast. Hence, all the efforts to prevent macro-segregation are usually aimed at controlling fluid flow and movement of solid, including (i) adjustments of the composition of the liquid steel or thermal gradients to induce a stable density stratification in the liquid, (ii) application of nozzles, baffles, porous materials, or electromagnetic fields to redistribute the flow, and (iii) modifications to the grain structure to change the resistance to flow through the solid network or the prevalence of equi-axed grains. Movement of the liquid flow and grains happens in the different stages of the complete ingot casting process. During mould filling, strong turbulence flow occurs, and it flushes the chilled grains on the mould wall down to the liquid and thus creating numerous nuclei. After a while it is decreased, but the flow of the liquid which inherits the turbulence pattern from filling still influences the solidification in terms of thermal and solute convection. During solidification, liquid flow is driven by buoyancy force because of the density differences. Natural convection happens not only in front of the columnar dendrites, but also in the mushy zone. Inter-dendritic flow is driven mainly by thermal and solute buoyancy force and partly by the forced convection due to the suction by shrinkage cavity formation. During the solidification process, globulitic or equiaxed grains can move along with the liquid due to the drag force, or they can sink down on account of the density differences. The behaviour of the grains in terms of sinking or ascending depends on the size, morphology of the grains, and also on the volume fraction of solid inside the envelope of single or agglomerated grains. Besides the buoyancy force, other forces caused by the motion of gas bubbles, applied magnetic fields, stirring, rotation and vibration also cause fluid flow and solid movement. The different types of macro-segregation patterns are described below. A-segregates arise due to the flow of solute-rich inter-dendritic fluid via thermosolutal convection. These segregates are characterized in the final solidified microstructure as channels of enriched solid, frequently with near-eutectic composition. Their formation mechanism can be described as follows. In steels the enriched inter-dendritic liquid is frequently be less dense than the bulk liquid, and hence has a tendency to rise. As the liquid moves towards the bulk liquid and to the top of the ingot, its temperature increases, but its composition remains nearly constant due to the slow mass diffusion. This hotter enriched liquid then causes delayed growth or remelting of the solid around it, creating persistent solute-enriched channels. A-segregates are also generally referred to as ‘channel segregates’ or ‘freckles’ when they arise in directionally solidified castings (when the melt is cooled from below, for example during the casting of single crystal nickel- based super-alloy turbine blades). The prevalence of A-segregation has meant that it is perhaps the most investigated of all macro-segregation phenomena, not only in steels, but also in many other systems. Some of the earliest studies which identified the importance of mushy zone fluid flow on macro-segregation, were made by the Japanese steel industry in the 1950s, and focused on A-segregates. These studies were one of the first to attribute the formation of A-segregates in steel ingots to the gravity-induced flow of enriched mushy-zone liquid, whilst others confirmed that liquid density changes due to composition were of critical importance. It was noticed that by reducing the silicon content and increasing the molybdenum levels, A-segregation could be minimized. Later on, it was established that A-segregates started to form in the mushy zone when the fraction of solid was between 0.3 and 0.35, and persisted until solid fraction was as high as 0.7. Similar results were found by studies of the NH4Cl–H2O (ammonium chloride-water) system, a favourite of researchers since its transparent liquid allows the mushy zone to be directly observed during solidification. During the NH4Cl–H2O studies, it was demonstrated that increased solidification times (and alloy freezing ranges) had increased the severity of channel segregation. The Pb–Sn (lead-tin) system was also the subject of a considerable research effort. During the studies of Pb-Sn systems, the examination was not only carried out on the compositional and liquid-density effects in Pb–Sn system, but also the extent of fluid drag within the mushy-zone network (the permeability) on channel formation. The nucleation and stability of channel segregates were like- wise investigated experimentally and theoretically in a number of studies. A-segregation is of specific concern to the producers of pressure vessels needed for nuclear power generation. These pressure vessels are produced by removing the core of the ingot after casting to create a shell, which is then forged and machined to finish. Welding is then done to attach nozzles or end sections, and there is a concern that A-segregates can impinge on these welds. The enriched material within the A-segregates is generally associated with increased hardness and decreased toughness relative to bulk, which can lead to reduced weld integrity. Fig 3a shows the A-segregation present in material taken from a low-alloy steel ingot (C- 0.2 %, Mn – 1.3 %, Ni – 0.7 %, and Mo – 0.5 %) after forging. Fig 3(b) and 3(c) show the difference in microstructure following slow cooling from austenization at 940 deg C at 0.1 deg C per second. The hardness of the positively-segregated material was around 80 HV2 higher than the bulk material in this untempered state. During the final stages of ingot solidification, the centre of the casting is usually occupied by a network of loosely connected equi-axed grains. 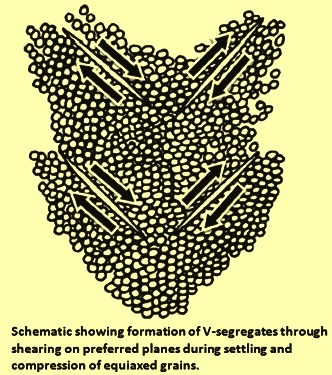 It is thought that V-segregates arise due to the fissuring of such networks under action of metallo-static head (the weight of material above) and solidification shrinkage (Fig 4) which leads to the formation of open shear planes which can fill with any remaining liquid. This remaining liquid is normally enriched throughout solidification by convective flows from the mushy zone, and also by solidification in the final cavity, and it solidifies to produce positively segregated solid. Indeed, the solidification of enriched material at the end of solidification generally produces the frequently referred as centre line segregation. Despite being regularly observed, V-segregation is normally not well understood other than through the mechanism explain above. Theoretical treatments and models of V-segregate formation in steel ingots have not been produced and are likely to prove challenging as they need to account for phenomena including equi-axed grain sedimentation, mushy zone deformation and fluid flow. Nevertheless, the total lack of information on V-segregation in ingots is perhaps indicative of a further issue which is the disinterest of producers and the users in the subject. It is often the case that the centre of the ingots are removed after casting (as highlighted above) or that the effects of V-segregation are insignificant for the end applications. It has been proposed that negative base segregation can arise in steel ingots due to two processes namely (i) the settling of solute depleted (negatively segregated) equi-axed grains at the bottom of the ingot under the action of gravity, and (ii) the general rise of solute enriched liquid upwards. However, there has been some difference of opinion over which of these mechanisms is predominant. Earlier studies have suggested that the flow of enriched liquid upwards was the dominant factor, citing the appearance of negative segregation in ingots which apparently contained no equi-axed zone. But in reality, it is rarely the case since steel ingots undergo fully columnar solidification, and more recent modeling studies have tended to lend greater importance to grain sedimentation. It has been found that the equi-axed zone in a low-alloy steel ingot may extend to well over half its height, and that the equi-axed grains at the very base of the ingot are more globular in form than those found further up the ingot (globular grains are rounder and not so branched, equi-axed grains typically start growing in this form before becoming dendritic). Disconnected grains can form through a number of mechanisms, which include heterogeneous nucleation in the liquid and dendrite-arm detachment. The predominant mechanism is generally detachment due to the action of convective flows or shrinkage stresses. It can be noted that if the density of enriched liquid is higher than the bulk, as is possible, then flow in the mushy zone is normally downwards, and this can reduce the severity of both negative base segregation and any positive segregation (enrichment) at the ingot top. Hot-top segregation, banding, and inverse segregation are some of the other types of segregations which can arise during ingot casting. Their formation and severity is dependent on casting procedures and ingot size, and hence they do not being always been observed in large ingots. Hot-top segregation – It refers to the positive segregation which arises below the top of ingots due to the flow of enriched liquid from the head of the ingot during the latter stages of solidification. If the temperature gradient moving away from the top surface of the ingot is conducive to solidification (due to insufficient insulation, as an example) then a dendritic front advances downwards from the head surface. Enriched, cool liquid from this solidification can then flow downwards and enrich the liquid below the top. During the early stages of solidification this enriched liquid can spread throughout the large liquid pool, but during the final stages (when solidification at the top is most likely) the enriched liquid remains at the centre and top of the ingot. Improvements in hot-top practices driven mainly by the need to reduce ingot porosity have led to the reduced levels of hot-top segregation in the present day ingot making. It can be noted that the hot-top segregation described here is distinct from the general positive segregation frequently observed at the top of the steel ingots, which is formed due to the advection of enriched liquid upwards. Banding – It is also known as bands of segregation and has been found due to the abrupt changes in temperature profile across the mushy zone during the early stages of solidification, which may be caused by thermal pulses from convection or changes in heat transfer due to air gap formation (unsteady heat flow). If the ingot does break free from the mould, solute-rich bands can be formed due to the remelting of solid and expansion of the mushy zone. Changes in conditions which lead to acceleration of the liquidus isotherm toward the ingot centre gives a similar result. Solute-poor bands are formed when the mushy zone size is reduced. Inverse segregation – it refers to the positive segregation which can arise directly adjacent to the cold mould wall. It forms due to the motion of enriched inter-dendritic fluid towards the wall to feed solidification shrinkage in the early stages of solidification. Its effects are not observed later on in the casting process since buoyancy driven flow dominates mass transport. Inverse segregation is found more prominently in direct-chill (DC) casting of aluminum alloys, but its significance in steel ingot casting is likely to be low and it is hard to find investigations on the subject.